I used to believe with a passion that my heart belonged in social sciences and humanities. Language and history usually top my list of favorite subjects. I had never viewed science as a first in my professional priorities, but one of my experiences last summer led me to discover my love for it and reconsider it as my primary choice. Last June 2016, I participated in ISIP’s annual Discovery Science Camp. 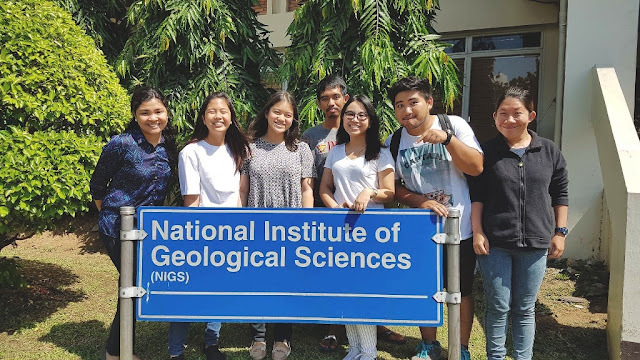 As a culminating activity, we took a trip to two science institutions in UP Diliman: the Marine Science Institute (MSI) and the National Institute of Geological Sciences (NIGS). We were toured around and taught about the work done by the scientists in these institutions. 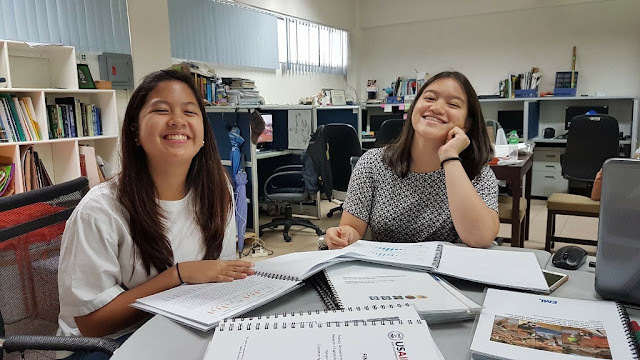 That summer, I was looking for a place to intern in and our trip to UP proved to be very timely because we found out that these two institutions were actually accepting applications for internships. Kuya Pau from ISIP connected us with the contacts he coordinated with for the field trip and from there, my friends Migo, Mikee and I took the leap and applied at NIGS. Soon after, we found out that we got accepted for a 2-week internship. Mikee and I were assigned to NIGS’ Environment Monitoring Laboratory (EML), while Migo was assigned to the team that handled Project NOAH. Honestly, I initially didn’t know what to expect from the internship. At the very least, I expected to learn a few skills that I could utilize in the future and go through the 2 weeks we were given. I did not expect to be welcomed so warmly and gain such valuable friendships with so many people. We were treated not just as interns but as real members of the team. They let us use their equipment, gave us our own work cubicles, and brought us along to their fieldwork! Geology used to be one of my personally unexplored branches of science. I had only basic knowledge and I thought I had very little adventure to look forward to in my time at NIGS. I was proven wrong. There is so much more to Geology than I thought and countless things to be fascinated about. 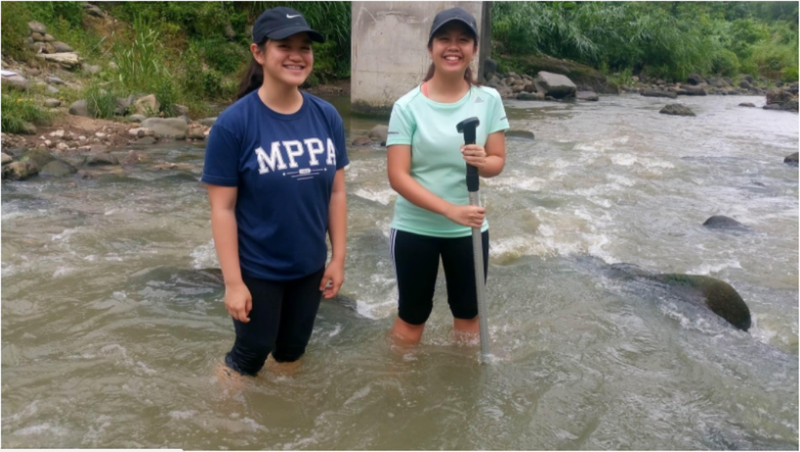 My first fieldwork experience in Dumacaa River left me breathless. Being in the river with the water rushing past me felt so exciting. It made me realize that if I was seeing such stunning sights only a week into my internship, I wouldn’t be able to imagine all the beautiful places actual geologists have been to. Aside from teaching us skills within the laboratory and in the field, it was great to have supervisors that taught us skills and lessons important in life, especially life after high school. We were shown how to commute around the university campus and were toured around, but at the same time, they gave us the independence to explore during our lunch breaks and other free time. They told us stories about their different experiences in studying and working in the field of geology. We saw how they communicated and dealt with people from all walks of life: local government officials, teachers, community members and many others. It was indeed humbling to be in the midst of brilliant, yet grounded people. My two weeks in NIGS opened my eyes about the field of geology. If at the start, I hadn't planned on going beyond the two weeks we were given, now I'm planning on applying again next summer. Now, I feel as if more doors of possibility have opened for me and my journey with science. If I had known that amazing opportunities such as this internship were just within my reach, I would’ve applied a long time ago. It really inspired me to discover more opportunities and expand my horizons so I can experience even greater adventures in the future.